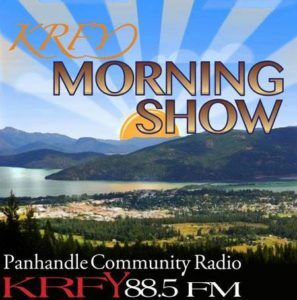 Here’s what’s coming up this week of July 9 on the Morning Show on KRFY. Airtime is 8 a.m. … but if you miss a show, you can hear a recorded podcast of it later in the day, on our Podcasts page. Tuesday, July 10: Hosts Julie and Phil talk with Mary Franzel and Britta Mirely about the Friends of Scotchman Peaks Wilderness summer programs – including its Goat Ambassador program that aims to keep hikers and goats both safe. Tune in at 8 a.m.
Wednesday, July 11: Wondering about all that construction downtown? City streets and the downtown revitalization project currently under way on Cedar Street are the topic for hosts Suzy and Chris as they talk with Mayor Shelby Rognstad, City Administrator Jennifer Stapleton and Public Works Director Amanda Wilson. Airtime is 8 a.m.
Thursday, July 12: The talk swings to the East Bonner County Library‘s plentiful programs, in particular the Summer Reading Program headed by Children’s Librarian Suzanne Davis. With hosts Jim and Jack, airing promptly at 8 a.m.
Got a question for any of our Morning Show guests? We like to ask questions from listeners, but you need to get it to us in advance of the show! Just drop us an email at [email protected] or call and leave a phone message at 28-265-2992.